Chicken, Quinoa, Avocado Salad Thyme for Cooking Summer Main Courses. I like to add quinoa or brown rice to a salad, to round it out and make it a full meal. Plus it adds an interesting flavor and texture. Heat Teriyaki sauce and walnut oil in a large skillet. 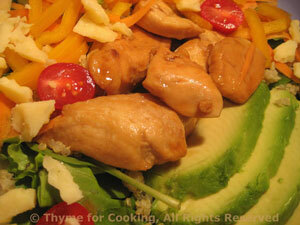 Add chicken and stir-fry until cooked through. Shred carrot using a vegetable peeler. Prepare lettuce, wash and spin dry if needed. Whisk together Teriyaki sauce, vinegar and mustard. Slowly drizzle in olive oil, whisking to combine. Put lettuce and herbs into a large bowl. Add half the vinaigrette and toss to coat. Spread the quinoa on top of the lettuce. Arrange the rest of the ingredients on top of quinoa. Drizzle with a bit more vinaigrette and serve, remaining vinaigrette on the side.